I'm so glad I finally got this post together for you all! I've had several questions about cloth diapering, and how it's been going for us, so I hope that this post will address anything you've been wondering about! I know when I was researching cloth diapering, it was hard to find answers to all of my questions in one place, so my hope is that this post will do just that for you! 1. What we're using. Bum Genius Elemental One-Size All-in-One purchased from Cotton Babies. I love these diapers! The fact that they're all-in-one and one size makes them really convenient to use. There are no separate liners, and since they're one size with adjustable snaps, they should fit her until she is potty trained. The colors are adorable, too! We purchased mostly gender-neutral colors, in case a future baby is a boy, but I also had to get just a few pink and purple ones! Initially, we started out with 18 of these diapers, but I quickly realized that we needed at least 6 more. Now we have 24, but I still have to do diaper laundry every day to keep up with it. If Audrey is even a little bit wet, she's going to let us know about it! That's a good thing though, but with cloth diapers, babies feel more wet than they do with disposables, so we go through lots of diapers each day! As far as blow-outs are concerned, I had read that babies have less with cloth. I think I'd say we've had about the same amount as compared to when we used disposables in the beginning. Maybe less now, but I think that has more to do with Audrey than the diapers themselves. 2. When we started. We started cloth diapering full time a little after Audrey was 3 months old. The diapers were too big on her when she was a newborn, but even if they weren't, I would not have had the energy to keep up with them. We were in survival mode for almost 3 months. Between my c-section recovery, Audrey's sensitivity to dairy (which meant crying all the time), and general newborn craziness, I could barely find time to eat something for lunch, let alone rinse and wash cloth diapers. Once we did start full time, it wasn't so bad. Now diaper laundry is just another part of my day, and it really doesn't bother me at all. I'm hoping for our next baby, I'll be able to start cloth diapers earlier on, but I'll just have to see how things are going when the time comes. 3. Washing and care. Like I mentioned, I do cloth diaper laundry every day. Bum Genius recommends washing at least every other day, but I can't imagine how many more diapers I'd need to go that long without washing them! For pee diapers, we just toss them into the diaper pail. For the poo diapers, we rinse them with a Bum Genius diaper sprayer before throwing them into the pail. The sprayer is great and I can't imagine using cloth diapers without it! Not to give you a mental image, but Audrey is still getting all of her nutrients from breast milk with a few solids here and there, so the diapers I deal with are mostly of the liquid kind. I hear things get a little different once baby is getting on more of a solid diet though. At this point, it really doesn't bother me at all to rinse out a few diapers each day. We don't have a fancy front loading washer with cycles I can pre-program, so first, I turn ours on just a short wash cycle with cold water and no detergent. Then, I do a regular hot wash cycle, with Bum Genius diaper detergent. Last, I do a rinse cycle with cold water. When I take them out of the washer, I do a quick check for stains, and if I find a few, I set those diapers aside to be put on my windowsill to get bleached in the sunlight. The other diapers go into the dryer. It takes about an hour and a half for them to dry completely. I was a little skeptical that the sunlight would actually bleach out the stains like Bum Genius suggests, but I have to say, it works perfectly! 4. Using diaper cream. You may know that you can't use diaper rash cream with cloth diapers, at least not without some sort of barrier between the cream and the diaper. The reason being, the diaper cream will leave a mark on the cloth diaper and mess with the absorbency in that area. I've been using the Bummis bio-soft liners as a barrier. I've also tried the GroVia liners, but didn't like them as much because they aren't as soft as the Bummis liners. I always use 2 liners for extra protection from the diaper cream, but even with doubling up the liners, we've still had a few incidents where the cream has somehow transferred onto the diaper. I think this is because they are semi-porous (sort of like a dryer sheet). That is my only guess as to how the cream has transferred, since I'm careful not to gob it on. I'm actually in the process of making my own organic flannel liners. I figure these will offer much better protection than the Bummis liners, plus they're organic, and I can just throw them in the wash and re-use them. I bought the cotton here. The liners I'm making are pretty simple; just 8x12 inches with hemmed edges. I don't plan on posting a tutorial for them, but let me know if you'd be interested in one. 5. Cloth wipes. I recently decided to start using cloth wipes as well. I figured it just made sense to go along with the cloth diapers, and Audrey's bottom seems to be looking better than ever since making the switch. She's never been one to have bad diaper rashes, but the cloth wipes seem to be more gentle on her bottom, and I love the fact that they don't leave her soaking wet like a regular wipe would. I'm using a combination of Charlie Banana wipes and wipes that I made myself (mine are pictured below). I started out with 30 Charlie Banana wipes, but when I realized we'd need a lot more, I decided to make my own to save some money. Also because, while I loved the fact that the Charlie Banana wipes were organic cotton, the other side was polyester fleece, and I happened to like that side best for wiping. It didn't seem worth it to me to keep paying for organic cotton when I didn't even prefer that side of the wipe. As for a wipes solution, first I tried the Bum Genius bottom cleaner. I liked it just fine, but the bottle didn't last long and it was a little expensive at $7.95. Once again, I decided to just make my own. 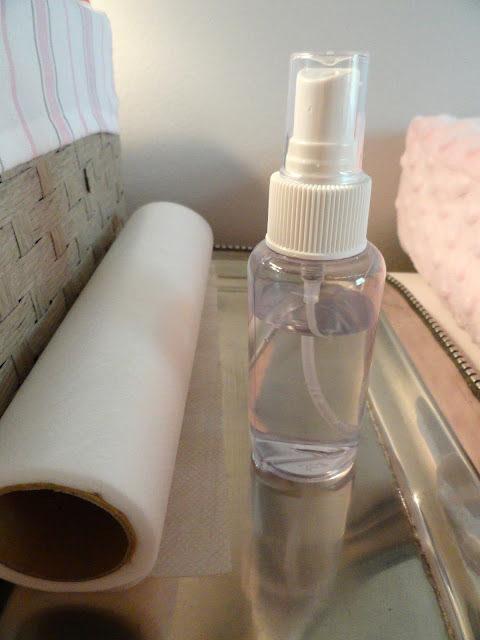 There are so many wipes solution recipes you can look up online, but I wanted to keep it very simple, so I just use water and California Baby Super Sensitive bath soap. I mix it up in a small bottle, so the solution is always fresh, and I just add a drop or two of the soap. I wash the cloth wipes separately from the diapers since they occasionally have diaper cream on them, and I don't want it transferring onto the diapers in the pail or in the wash.
6. Diaper pails. I use white plastic trash cans from Target for the diapers and the wipes. I have a smaller (about 7 gallon) pail for the wipes and a larger (about 13 gallon) pail for the diapers. I line each with a Kissaluv's pail liner, and I have 3 liners total. One for each pail, and one extra so that when one is in the wash I can replace it. These liners are great because you can just take them out of the pail, dump the diapers or wipes into the washer, and throw this liner in with it. 7. When we don't use cloth. I use cloth diapers almost 100% of the time, with a few exceptions. When we go to New Jersey with Audrey, I take disposables (as well as disposable wipes). Even though we'd have access to a washer and dryer, I wouldn't have my diaper sprayer, and I think it would be pretty difficult to get the diapers clean without that. We have an upcoming family trip to North Carolina, and we'll be using disposables for that as well. We've had our family watch Audrey two times over the last 6 months, and we've had them use disposables just to make it easier on them. I don't think they'd be too thrilled with rinsing out the diapers! Otherwise, I use the cloth diapers all the time. There has been one or two times when Audrey's bottom has been more red than normal, so sometimes in that case I'll put her in disposables if I really want to put a thick layer of diaper cream on her. That way, I don't have to worry about it coming through the liners and onto the diapers. I won't have to do this once I'm done making her flannel liners, though. We use Huggies Pure & Natural diapers or Whole Foods 365 brand, when we need disposables. I also try to get Seventh Generation wipes, since they are chlorine-free and un-scented. Well, I think that should cover it! I know this was a really long post, but I hope it's helpful and informative! Let me know if you have any other questions, I'd be happy to answer them. I'll be posting a tutorial soon on how to make the cloth wipes, too! If you cloth diaper as well, let me know if you have any tips or tricks of your own! Thanks for sharing your experience! I have 26 diapers and I have to wash every day as well! I totally don't get how people wash every other day with the recommended 18! I know right! I don't understand that either! I'm relieved to hear you're in the same boat! Thanks so much for the post Rachel! 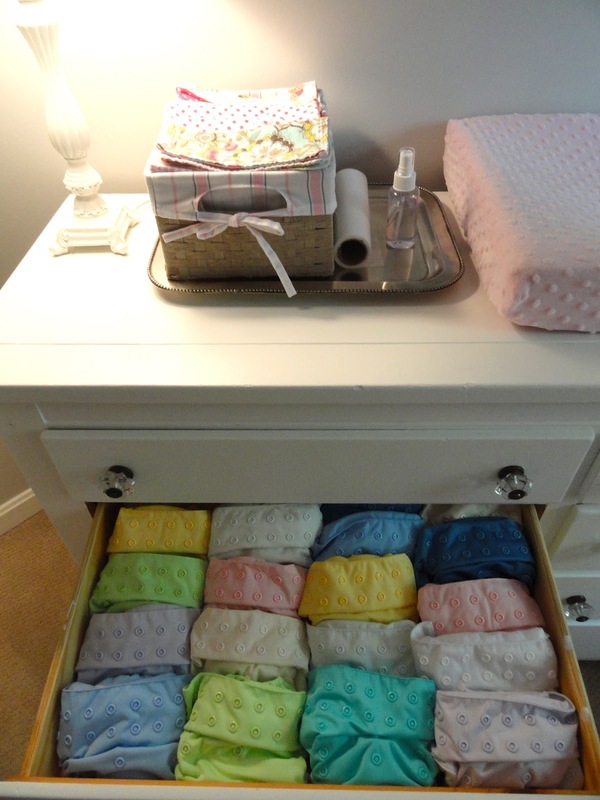 This gives me hope that it will work :) plus cloth diapers are way cuter than disposibles! I love that they are so much better for the baby too. Bum Genius seems like the way to go, from all the reviews i've seen. Hi Bethany! You are very welcome! I haven't tried other brands, but I have to say that I'm very happy with these so far! I'll be interested to see if they really do fit her until after she's potty trained! We use lots of different brands -- I have a couple of the BumGenius all in ones like you use, and also a few of the BumGenius pocket diapers. I personally like the pocket diapers WAY more because they feel dry on baby's bum three times longer and dry in the dryer three times faster. Honestly. When Owen wets his BumGenius organics, he needs to be changed immediately, but with the fleece and microterry, he's good for much longer. I am in the process of trying to decide between these diapers and the 4.0 bumgenius. I am curious how your diapers have held up until this point, are you still putting them in the dryer? Also, how they are with blow outs? So glad I happened to find your blog today! We are going to cloth diaper our baby that is due in March, and I was wondering about the diaper pail, sprayer, and making my own wipe solution. Thanks for a great post!